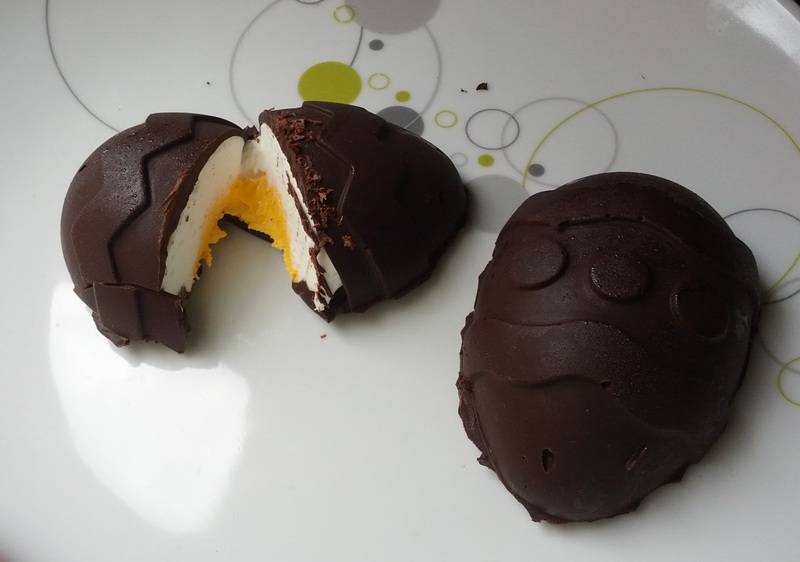 Since making these, I don't really enjoy the Cadbury variety that much - the chocolate is too cheap and milk-y, the filling is overly sweet, and the chocolate to creme ratio is a bit high. This is probably good - it prevents temptation in the Easter candy section, but obviously it requires a bit more effort to get my fix! It's totally worth it once a year though. Bring water to a simmer. Put about half the chocolate and 1 tablespoon of oil in the top of your double boiler and melt, stirring continuously with a heat safe spatula, until almost entirely smooth. 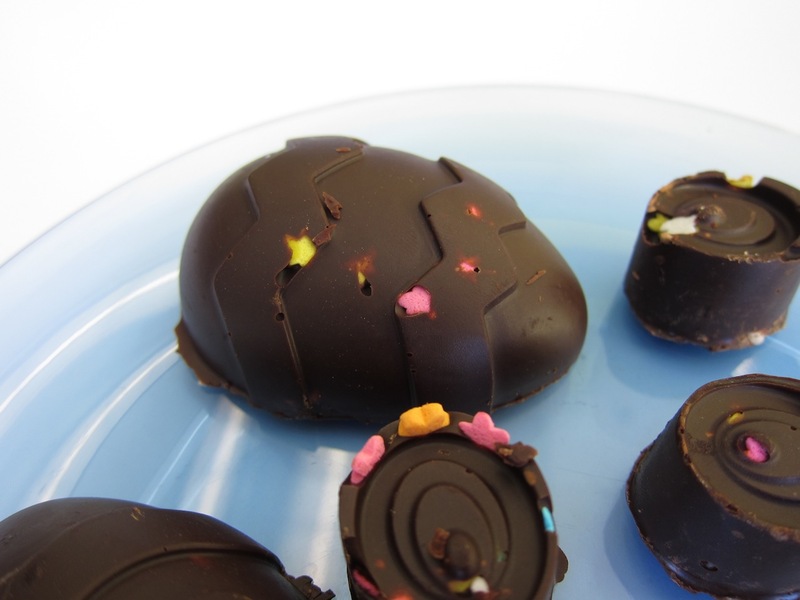 Make sure your mold is clean and dry, and put a dollop of chocolate in each well. Using a regular spoon, smooth the chocolate around inside and up the sides of the mold, making sure there aren't any holes. Pop in the freezer while you start the filling. Keep the remaining chocolate around - you'll need to reheat it later! Cream together the butter, corn syrup, 2 cups powdered sugar, and vanilla, using the paddle attachment on your mixer. Set aside. Start your double boiler again - this works best if you can use a one of the bowls from your stand mixer over your simmering water. In the metal bowl, whisk together egg whites and granulated sugar, then place over the boiler. Whisk constantly until the egg whites are foamy and the sugar is dissolved (pinch some between your fingers - it shouldn't feel grainy at all). Move the egg white mixture to your mixer, add the whisk attachment, and whip on speed 8 until it's room temp - this will take several minutes. Once it's cool, switch to the paddle attachment (no need to rinse from the earlier mixture) and add the butter mixture, remaining 2/3 cup powdered sugar, the cornstarch, and the almond extract. Beat on medium speed until it's all combined and fluffy. Remove about one third of the mixture to a smaller bowl and tint yellow. Put the white and yellow filling mixtures into separate piping bags. 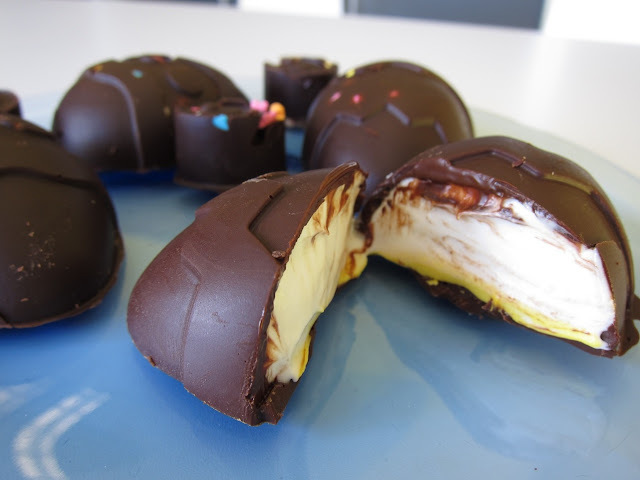 Get your chocolate shells from the freezer. Pipe white filling into each chocolate shell until it's about 2/3 full, then go back through and pipe a bit of yellow in (they should be full but not overflowing - see photo below!). Return to the freezer. Melt the chocolate over the double boiler again, adding more chocolate and/or oil if necessary. Let cool for a few minutes as before. 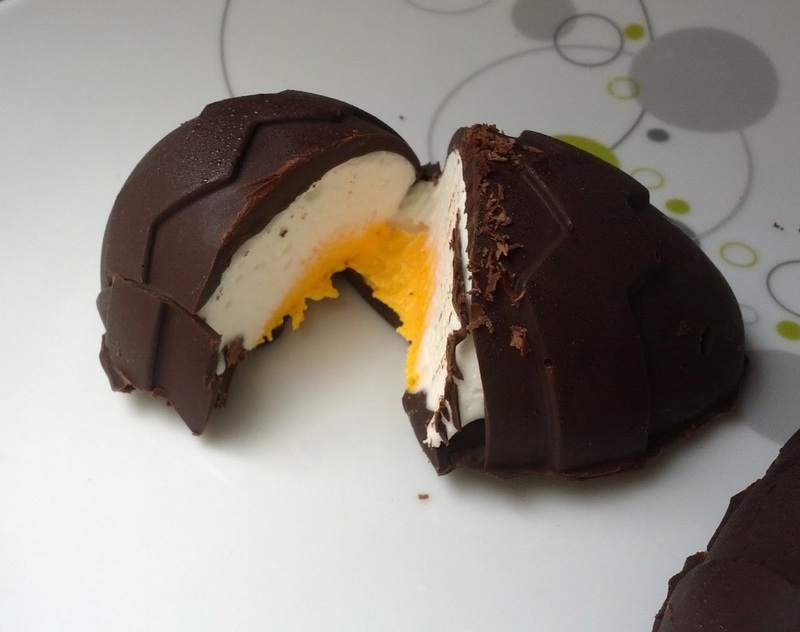 Once the filling is cold and slightly firm, dollop some chocolate on each egg and spread to completely cover the filling. Return to the freezer one more time. 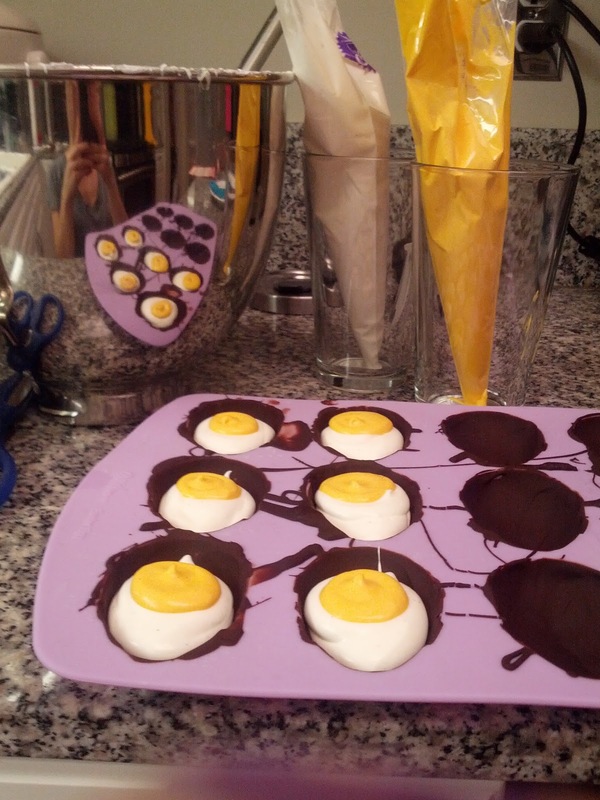 When the last layer of chocolate is completely hard, you can pop the eggs out. 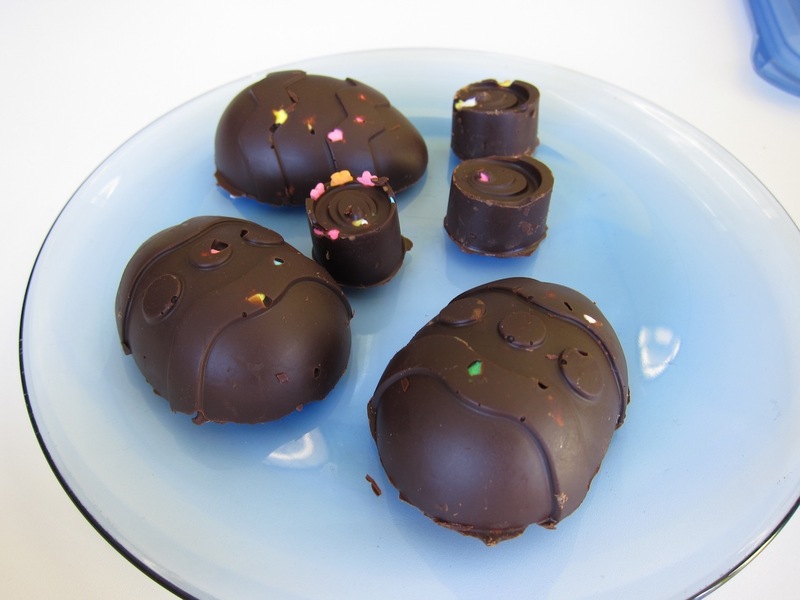 Silicone molds are great because you can just push the mold inside out, and the candy will come right out. If you have more chocolate and filling than molds, you may need to repeat the melting, chocolate coating, filling, and final chocolate layer steps again, with a bit of freezer time between each step (maybe this is a good time to start cleaning up). All done! Store in the fridge or freezer in an airtight container - eat cold, or bring to room temp for a gooier filling. Nice! That looks ridiculously yummy! This is amazing. I have a slight obsession with Cadbury eggs and I ran out this morning. I am going to try and make this. They look delicious. I had no idea that yellow filling was just different food coloring.